(-)-epicatechin gallate is a major catechin component in green tea . (-)-epicatechin gallate (ECG) plays an important role in cell growth inhibition, apoptosis and membrane transport system . 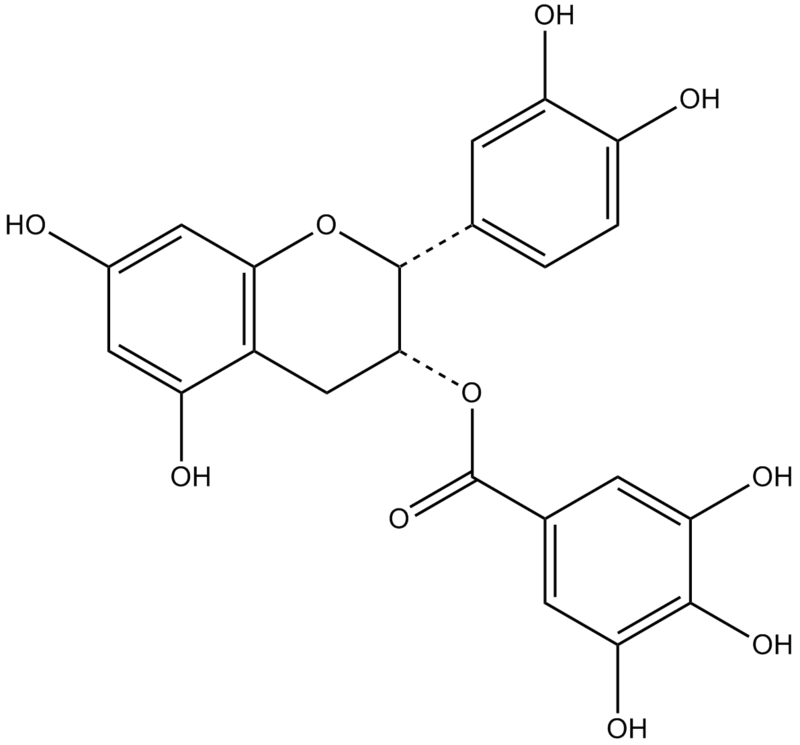 (-)-epicatechin gallate is a kind of catechin. In HCT-116 cells, ECG activated transcription factor 3 (ATF3), which played a critical role in pro-apoptosis. EGR-1 was involved in ECG-induced ATF3 expression. In HCT-116 cells, ECG (50 µM) increased NAG-1 and ATF3 expression in time- and dose-dependent way . In carcinoma HSC-2 cells, ECG (50 µM) exhibited cytotoxicity with midpoint cytotoxicity (NR50) value of 67 µM. However, in normal HGF-2 fibroblasts, ECG exhibited cytotoxicity at concentrations up to 25 µM with NR50 value of 100 µM. In carcinoma HSC-2 cells, ECG (250 µM) induced nucleosomal DNA fragmentation and apoptosis. ECG (150 µM) significantly increased caspase-3 activity . In rats, there were five metabolites of ECG: (-)-epicatechin gallate, 3’,4’’-di-O-methyl-(-)-epicatechin gallate, 4’’-O-methyl-(-)-epicatechin gallate, 4’-O-methyl-(-)-epicatechin gallate and 3’-O-methyl-(-)-epicatechin gallate, which were excreted in rat urine .
. Cho KN, Sukhthankar M, Lee SH, et al. Green tea catechin (-)-epicatechin gallate induces tumour suppressor protein ATF3 via EGR-1 activation. Eur J Cancer, 2007, 43(16): 2404-2412.
. Babich H, Krupka ME, Nissim HA, et al. Differential in vitro cytotoxicity of (-)-epicatechin gallate (ECG) to cancer and normal cells from the human oral cavity. Toxicol In Vitro, 2005, 19(2): 231-242.
. Kohri T, Suzuki M, Nanjo F. Identification of metabolites of (-)-epicatechin gallate and their metabolic fate in the rat. J Agric Food Chem, 2003, 51(18): 5561-5566.